The LOPA Summary can be viewed by clicking on the required Hazard ->SIL Determination -> LOPA -> <Consequence> Summary. A summary of the configured Initiating Events, IPLs and Conditional Modifiers can be viewed for each of the selected Consequences (i.e. Safety, Environmental, Financial and Reputation). View a summary of each Initiating Event with its corresponding frequency, and the configured IPLs and Conditional Modifiers with their respective factors. The calculated Mitigated Event Frequency (MEF) (also commonly known as Intermediate Event Likelihood) is presented for each Initiating Event. The MEF presents the frequency of the initiating event occurring taking into account all mitigation factors (IPL’s and Conditional Modifiers). The MEF and Total MEF are calculated with a frequency of ‘per year’. 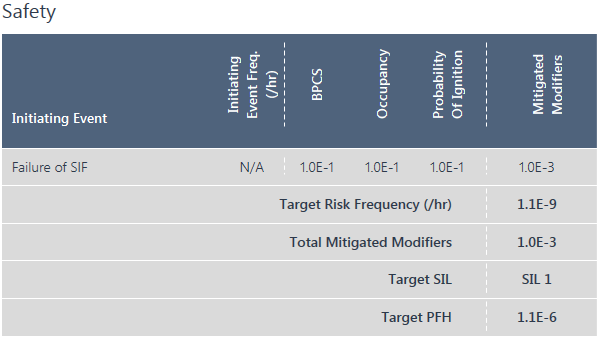 Also shown in the Summary are the Target Risk Frequency (set via the Consequences screen), the Total Mitigated Event Frequency (sum of the individual Mitigated Event Frequencies), the calculated Target SIL and the Target PFD of the SIF being analysed. As the SIF is continuous the only Initiating Event is the failure of the SIF. All configured IPLs and Conditional Modifiers are presented with their respective factors. The Mitigated Modifiers column shows the total combined factor for all IPLs and Conditional Modifiers. 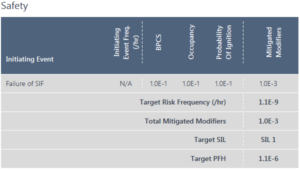 Also shown in the Summary are the Target Risk Frequency (set via the Consequences screen), the Total Mitigated Modifiers (sum of the Mitigated Modifiers), the calculated Target SIL and the Target PFH of the SIF being analysed.